You cannot go to Portland and not go to Voodoo Doughnut. 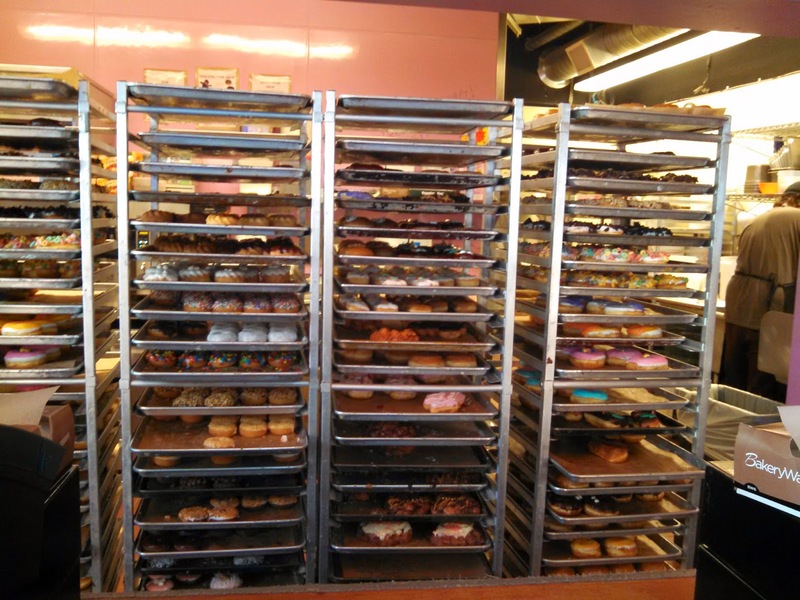 When I started thinking about food in Portland, my first thought was: Voodoo Doughnut. There are several locations. Our hotel was conveniently located a block away from the original location, which is on SW 3rd Avenue. There is almost always a line. It became our 'returning to the hotel' routine - to glance down the street and see if/how long the doughnut line was. Bright pink fence. Bright pink boxes - we saw lots of people carrying these pink boxes around the city. The Voodoo Doll (filled with raspberry jelly, topped with chocolate and a pretzel stake), Apple Fritter, Lemon Chiffon Crueller (vanilla frosting, lemon dust, 3 tiny marshmallows), and Portland Cream (like Boston Cream but with eyeballs representing the vision of Portland). 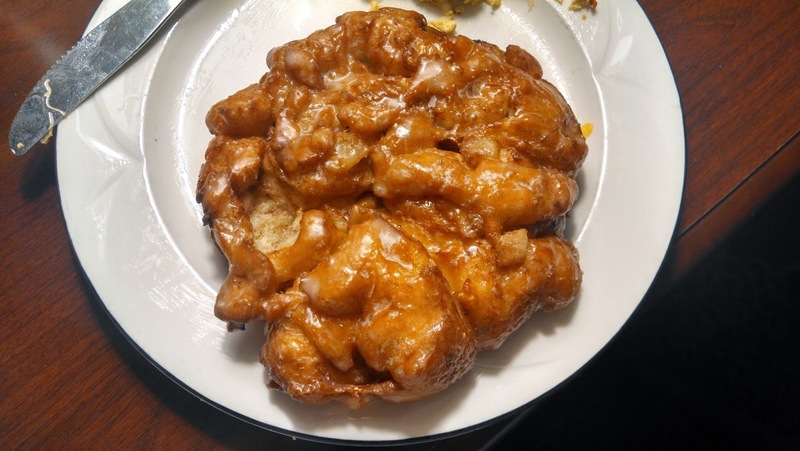 After eating some real breakfast (breakfast was included in our room rate so every morning SP went down and brought me back a ham & cheese omelet, bacon, sausage, a muffin, orange juice, and tea), we split the apple fritter. Really good! Lots of little apple bits. We ate the other doughnuts for dessert and breakfast the next day. All were tasty. Our last day, we bought 2 'normal-ish' doughnuts, just to see how they tasted: blueberry cake and cinnamon sugar. Overall, I really liked Voodoo Doughnut. They're tasty. They're fun. They're famous from all the food/travel TV shows talking about them. If you're in Portland, you should try them. I had to try them too when I visited Portland a couple years ago too. Even despite the line, I liked them quite a bit but I didn't really think they were the best ever. I feel horrible saying that. =( I'm just such a fan of our own Pittsburgh's Peace, Love, & Little Donuts that my bar for donuts is ridiculously high. I agree - Voodoo is really good, and they're fun, but not the best ever. We like Better Maid (the pink house place in west end) & Party Cake (Mt. Lebanon) here in Pgh just as much as Voodoo.